It works like this in the Nordic (not Scandinavian) country: on Valentine’s day you’ll be looked at suspiciously if you make a great love gesture to your significant other. In Finland, the 14th of February has very little to do with crushes, couples or people in love. But nonetheless it has a special meaning. This only happens in Finland among very good friends. Source (CC: by-nd). Ystävänpäivä is the Finnish name for St. Valentine’s day. It means “Friendship Day” in the Finnish Language, or “Day of the friends”. This is NOT a popular present for Valentine’s day in Finland. Source (CC: by-nc-sa). A trip to the far North doesn’t guarantee that you will see an Aurora Borealis – even though some places are better than others in Finland, and at certain times you can see them better than at others (late winter and early autumn are especially good). Is there a way to get a Northern Lights forecast or predictions? 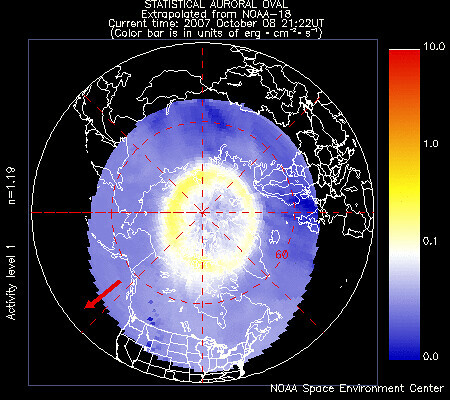 In the following image we can see the current extension and position of the Auroral Oval over the Northern hemisphere. This image is composed thanks to multiple passes of the NOAA POES satellite. The red arrow points to midday (and therefore there is sunlight there: no chance to see any Northern Lights). In this link you can see the latest image of the NOAA POES satellite. The golden rule to get your Northern Lights forecast: the redder the color of the Auroral Oval, the higher the chance that an Aurora will occur. To be more certain, we should also look at the “n” factor on the image; it will tell us how much we can trust the data. If n is bigger than 2, the data is pretty accurate. If it is lower, you can take the Northern Lights forecast with a grain of salt. How is the Northern Lights prediction calculated? The activity level of the Northern Lights is calculated statistically, in accordance with the flux of particles that travel from the sun and that ultimately provoke this phenomenon to appear. The satellite makes a pass over the Earth every 10 minutes and measures the strength of the particles flux. This measurement is superimposed over an Earth map and gives a pretty good estimate of the place, the extension and the intensity that is happening on the Auroral Oval. Thus, all this information is used as a Northern Lights forecast on the Northern Hemisphere. If you’re planning to go this year to see the Northern Lights in Finland, a good place full of Aurora information is the National Research Center of Northern Lights in Sodankylä, in the Finnish Lapland. After all, if the Finns chose that place for their research facility, they know that a lot will happen there. Other great places with easy access to roads, towns and accommodation in that area are Luosto, Saariselkä, Rovaniemi or Oulu. 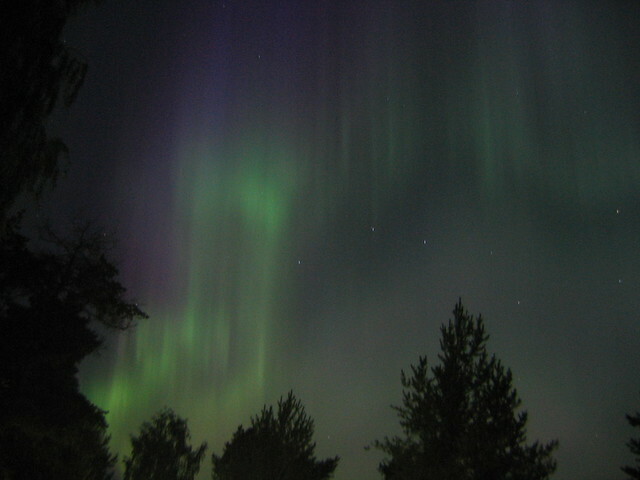 If you’re curious how the sky over Sodankylä is looking right now, here’s an updated photo of the sky in this region. Have you used the NOAA POES Northern Lights forecast before? Do you use apps or other resources for forecasting Aurora Borealis? Let us know in the comments below. When it was time to decide where I was going to travel to for my Erasmus – Sweden or Finland – it didn’t cross my mind that one of these countries was Nordic, while the other was Scandinavian. What a thing to look back upon! In my mind the terms Nordic and Scandinavian meant the same thing, and if there were nuances about their use, it did not seem important at the time. I just wanted to go up north, to a country where lectures were in English (and a country that was not the UK or Ireland) and that was enough for me. In the end, equating these two important terms was a mistake. In the north of Europe, they magnify the little differences between one another and hold on to them tightly. Later on, and with the aim of speaking properly during my stay, I came across an article on a website called Nordic Culture. The article isn’t available anymore, but these ideas were the ones that I managed to save from it. Did someone correct you when you called a Finn “Scandinavian”? Is Sweden a Nordic or a Scandinavian country? As mentioned above, most of the world treat the words “Nordic” and “Scandinavian” equally, but that isn’t quite right. But is there a common definition? Apparently in the north of Europe, the countries themselves can’t agree on a definition of “Scandinavian” and “Nordic”. 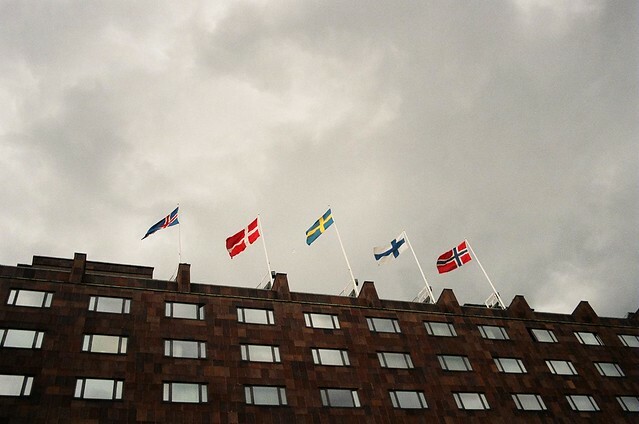 Are these flags from the Nordic Countries or from Scandinavian Countries? Depends who you ask. (But they are Nordic, I explain below) Source. “An island at the border of the World”. That’s how the Greeks and Romans – the first to write about Scandinavia – said about this location. They had vague ideas about it, and thought its population was the same as in Germania. There are two ways to approach the Scandinavian concept: geographically and linguistically. 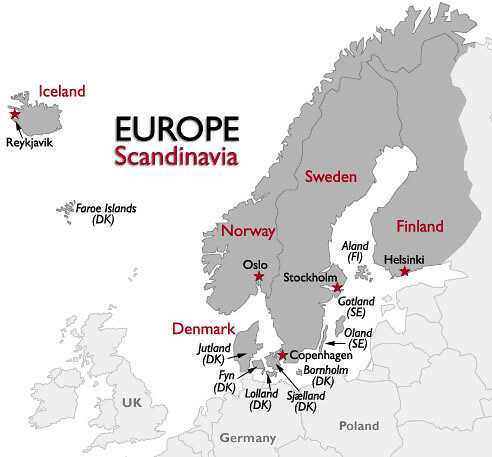 Geographically, there is such a thing as the Scandinavian Peninsula. It encapsulates Norway, Sweden and Lapland, the north of Finland. In this way, Scandinavia is just Sweden and Norway. If we approach the matter linguistically, Swedish, Danish and Norwegian languages have a common word, “Skandinavien“, with a common meaning: the land of the Northern Men, which is for them Sweden, Denmark and Norway. This is the definition of Scandinavia most agreed upon. But linguistically it also gets tricky: the Icelandic language also comes from the same linguistic root as the Scandinavian languages. Therefore, some people include Iceland in the mix. Furthermore, Swedish is spoken in some parts of Finland, as Finnish is spoken in certain parts of Sweden. An extreme definition, although not correct, of Scandinavia includes Finland. Also, culturally and historically Sweden, Denmark and Norway had their own Game of Thrones, where Iceland was part of Norway and Denmark at some point, and Finland was part of Sweden. Since these countries couldn’t agree, the French came to the rescue with another term: “Pays Nordiques“, Nordic countries, which also became a standard. It encpsulates Scandinavia, Iceland and Finland. Besides that, one more term is “Norden”, which came out of the Nordic Council – a forum for inter-Nordic cooperation – to refer to these countries, but this term is quite unknown in English. This map is wrong and now you know why. The Baltic states of Estonia, Latvia and Lithuania are not considered Nordic or Scandinavian. Nor is Greenland. Nonetheless, there are a some close ties with the Nordic Countries. The Baltic Republics have always been strongly influenced, especially culturally, by the Nordic Countries – the Estonian language, for example, is quite close to Finnish. The same can be said about Greenland, a territory that is actually closer to the American continent than to Europe, but politically belongs to Denmark. Half of its history is very much tied to Denmark and that’s why some people tend to include Greenland among the other Nordic Countries. The best definition of Scandinavia? Sweden, Denmark and Norway. Of Nordic, the Scandinavian Countries plus Finland and Iceland. What’s your side of the debate? What did the inhabitants of these lands tell you? Is it Finn or Finnish? Funnily enough, I can translate some of a debate that we had on the Spanish Big in Finland website about the words “finés” and “finlandés”, since they are often used as synonyms despite not quite being the same. One of them – finés – was for the language, and the other one – finlandés – was for the people who live in Finland. In English, the debate, or rather the doubts around the words’ use, is a bit different. In English we have the words “Finn” and “Finnish”, which are not synonyms. The main difference between them is that the word Finn is a noun, while Finnish is an adjective. This is the Finnish language. Source. When you talk about the people of Finland, you can say that they are Finns or that they are Finnish people. “Finnish”, without a noun next to it, doesn’t refer to the people. Here we can also attach any other noun that links to Finland like “Finnish language”, “Finnish design”, etc. “The Finns”, as such, refers to natives of Finland or the population of Finland. 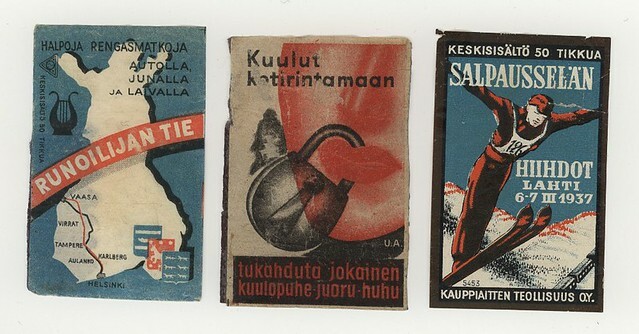 What they call themselves, in Finnish language, is suomalaiset (in singular suomalainen). Earlier we also said that “Finnish” is an adjective, for example in the case of the language. But since in Finland there are two official languages, we can distinguish between Finnish-speaking Finns and Swedish-speaking Finns. Another language that is not official is the Sámi language. The Sami people born in Finland – some of them are also from Norway and from Sweden – are also Finns. They are sometimes depicted as the original Finns, since they are the native population of the country (they look more like people from Mongolia than what we have in mind about the Finnish people). An interesting issue? I think so. And, last but not least, this is a Finn too. In fact, it is all of Finn. Finn, from the great tv series Adventure Time. Source.